 At Burren Fine Wine and Food it is central to our strategy that our little operation adheres to the concepts of sustainable tourism, we aim to meet the needs and expectations of our visitors while respecting our surroundings. Once a guest arrives to us they can forget about transport for half a day at least, all activities are out door, walking, cycling, even an outside dining option. Guests are briefed on a Minimal Impact Farm Walk and the principles of Leave no Trace. Indoors most of our lighting requirements are gained from natural light, heating is from a wood burner, waste is minimal, rain water is harvested in water butts and used for gardening and our electricity is monitored on a daily basis. A green purchasing policy is in place. Our walks and cycles are designed to suit individuals of varied interests and abilities. Small groups of between 5-10 people guarantee a personalised experience to each guest. Our groups normally get involved in positive interaction and social exchange that continues long after the walk over a glass of wine or a relaxed meal in Burren Fine Wine & Food. Energy: We use LED (low energy) light bulbs. Velux windows throughout the building reduce our energy use as they allow natural light and heat into the building. We use a wood burner for the colder days. Monitor and manage on a daily basis. Electricity is purchased from Airtricity who capture a high percentage of their power from sustainable sources. The toilet is fitted with an automatic light sensor. All electrical equipment is serviced on a regular basis. Water: Rainwater is collected from the roof into water butts and is used for watering flowers, plants and vegetable patch. Our dishwasher recycles the water and we have a best practice dishwashing process in place. The importance of using a sink stopper is impressed on all staff. We regularly check for water leaks and damaged pipes. In 2015 we installed water meters. Waste: Staff training, regular checks, neighbours with hungry dogs and a comprehensive 3 bin system makes for a good waste management policy. Waste paper and plastic is recycled. Raw kitchen waste is composted and cooked wasted collected for dog food. Some glass is re used in our kitchen otherwise recycled at the local centre. We use Fair trade and recycled products where possible. Where possible we source our foodstuffs locally from sustainable sources eg. Farmers markets, direct from the farm, local cheese maker, butcher and fishermen. We do our entire baking in house, bead and desserts are made to meet our daily requirements cutting down on refrigeration costs while given a guarantee of freshness to the customer. We use reusable bags and a large basket for shopping; we endeavour to shop within a 30-mile radius of our business. We have improved our Green Purchasing policy in 2015 by bulk buying with other network members from Lucart. A Company offering an Eco natural line of products made from recycled cellulose fibres for all our paper requirements. We purchase our wine in Europe from environmentally aware suppliers. Klosterneuburg have been certified as the first carbon neutral winery in Austria. Our French suppliers are growers in the sustainable development responsible winemaker’s organisation who are actively committed to the protection of the land and working daily to ensure a sustainable quality of life. We can arrange bike hire from the village of Ballyvaughan to travel the two miles to Burren Fine Wine & Food for Lunch or for the Rathbourney Valley Guided Walk. Any wine purchased while cycling will be delivered free of charge to the village or to local accommodation. We offer “a free cup of tea when you cycle to me”, a Burren Ecotourism initative. Bus Eireann passes Burren Fine Wine and Food and stops at Ballyvaughan. Promote local attractions, accommodation, etc. Help the visitor to learn about all the wonderful things to do in the area. We are actively involved in promoting our local area through Burren Ecotourism Network, Ballyvaughan Community Development, Burren Beo Trust, Ballyvaughan Tidy Town and Village Hall Committee. As a BEN member I take part in the “payback scheme “organised group events like Meitheal and other clean ups or wall building that take place in the spring and autumn each year. A little thank you or pay back to the farmers in the local community that allow guided walks through their land. I am also a volunteer on the Adopt a Hedgerow programme since 2015 undertaking to keep a specific stretch of road clear of litter. At Burren Fine Wine and Food we are very aware of the effects of climate change; we have information and tips on how to improve one’s personal carbon footprint available to our visitors. The many trees around the property help offset our environmental impact. Our Menu is printed on recycled paper. We participate in ongoing courses run by BEN to improve our knowledge and of the Burren and be better equipped to pass on information. We have fruit trees and bushes and use the fruit to make desserts and jams for the café. The broken-down compost is used to nourish the vegetable patch, shrubs and plants. All old hedgerows are undisturbed. We have planted some young native trees in recent years but as we are surrounded by very mature trees we are plant a few; trees help to offset our environmental impact by “breathing” in CO² emissions as they grow. The trees also provide sustainable habitat for wildlife and enhance the landscape.